( Updated on 30th March 2015: The Om Nom Drawings shown below are for "Cut The Rope" ver. 2.5 (Full version). There're 21 drawings so far. "Hello CTRopers... I finished playing CTR and wanted to get all the drawings so I came here for help... all good except for levels 6, 7 & 8. I'm playing through Android, CTR is CTR FULL FREE 2.3 updated in Jul 26. According to this page, one of the pictures is from Facebook, levels 6, 7 & 8 have four drawings; so from the other 14 pictures (of 19 total) I had no problem, the level numbers are good BUT the level pictures showing the location aren't correct in a couple of cases, sorry but I don't remember which cases, there were like 5 cases where the drawing was placed in a different spot that showed the pictures above, so take your time they're there. Back to the issue with the levels 6, 7 and 8... so the numbers above if you're playing on Android level 6 is now 7, level 7 is 8, and level 8 is 6... so go look for 6-1, 6-15, 7-17, 8-14... you will find the exact same drawings pointed above." 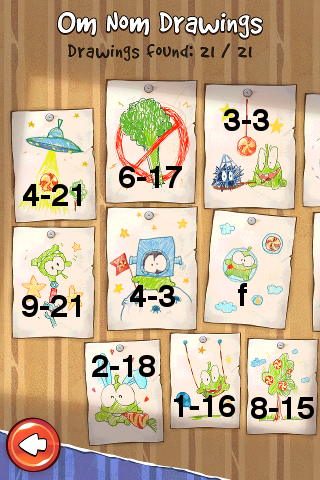 (1) For the "Om Nom Drawings" in "Cut The Rope: Experiments" (ver. 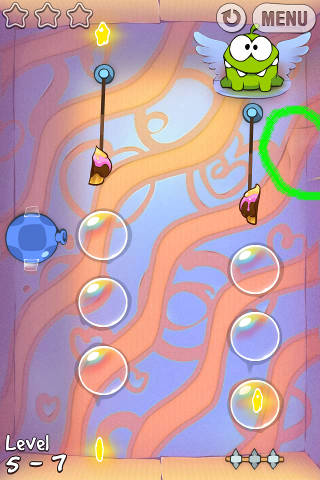 1.7.3), please read the article Om Nom Drawings in "Cut The Rope: Experiments". 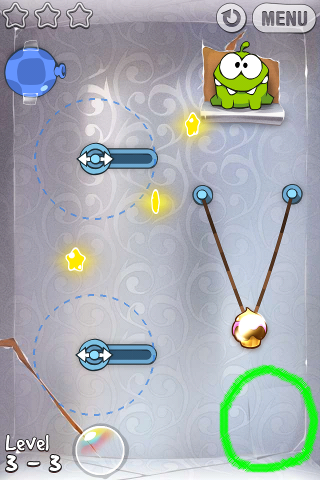 (2) For the "Om Nom Drawings" in "Cut The Rope Free" (ver. 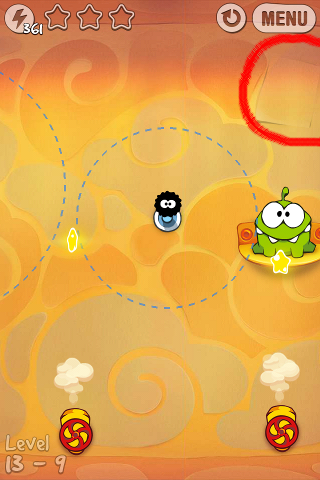 2.4.5), please read the article Om Nom Drawings in "Cut The Rope Free" (ONLY 3 drawings so far). 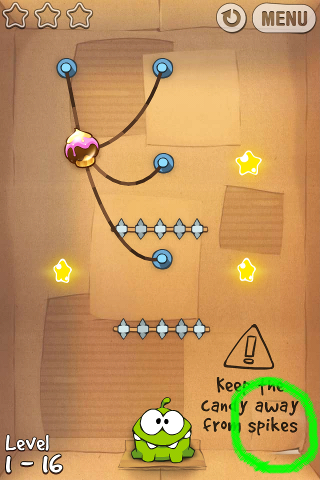 (3) "Cut The Rope: Holiday Gift" (ver. 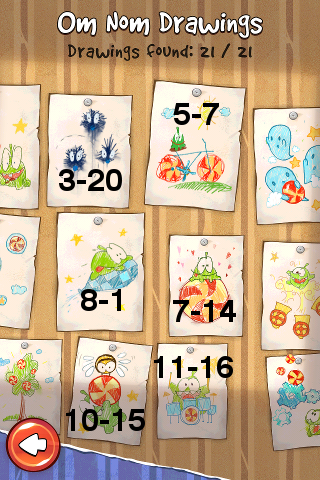 1.1 up to 1.7) (FREE app) does not have this type of drawings but it has an interesting "greeting card" creation feature, read NEW "Greeting Card" Feature in "Cut The Rope: Holiday Gift". Please look at all the screenshots above. 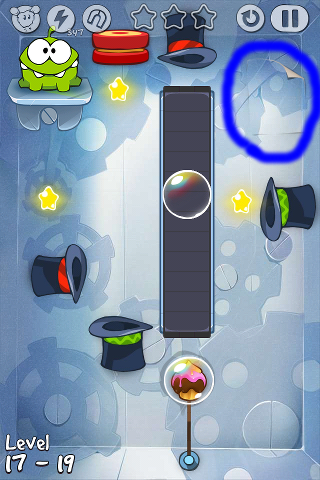 Just tap on the circled region inside the game level to get the drawing. The drawings can only be found once. For the drawing which I labelled with "f" in the 1st screenshot, you have to tap on an "f" icon at that location, then tap on a "Like" button inside a message (they only appear before you get the drawing) and log in your Facebook account. Actually you don't need to own a Facebook account or successfully log in a Facebook account to get the drawing, but this may change in future versions. 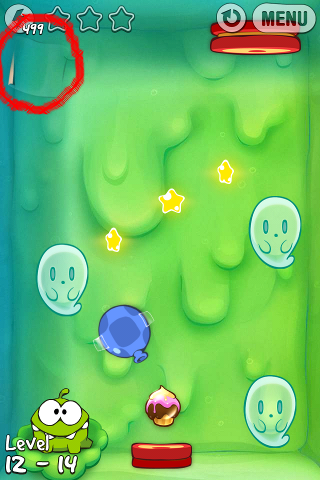 For those levels whose gameplay area is more than 1 screen, like 2-18 (hidden drawing location at bottom left), you have to play the game until the candy moves near that location and the hidden drawing (looks like a piece of paper) appears on screen then you can tap on it. 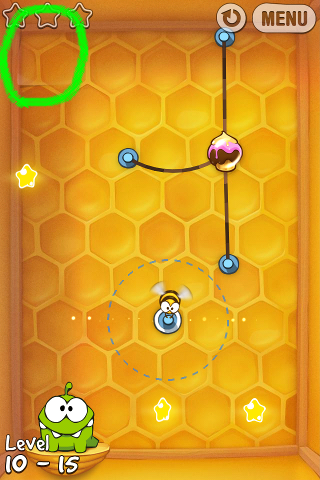 Just want to inform you the next update contain new level called Buzz Box and the next hidden drawing is in 10-15. Thanks for the information. 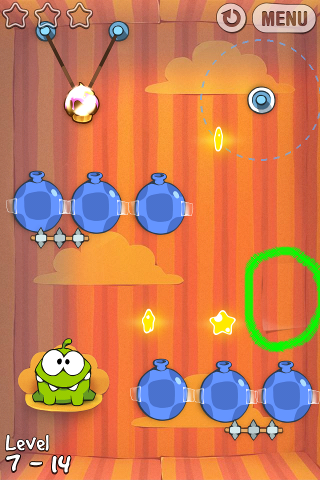 I was busy playing "Angry Birds" World 18 recently when suddenly ZeptoLab released "Cut The Rope" ver. 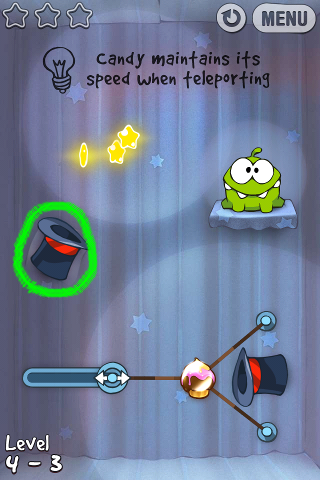 1.6, "Cut The Rope Lite" ver. 1.2.2 and a new app called "Cut The Rope: Comic". With the re-ordering of the boxes, the levels are not correct for where the drawings appear. Thanks for informing me about this. 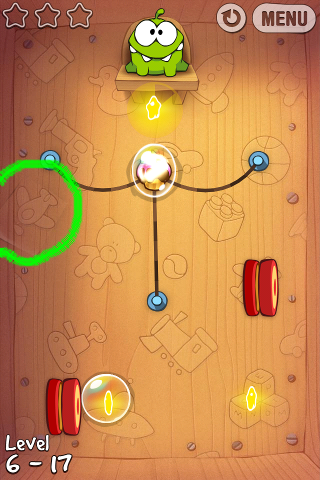 Hi david, I really cant find the draw in Level 7-14 of "Cut The Rope"(gift box), i tried both the new level 7-14 nd the gift box one, NONE to be found there. The drawing with a BIG candy and small hearts around nom nom..if u get which I mean. I've deleted my previous reply because according to the player "panda" below, the drawing locations for iOS and Android versions are different for some drawings. When I read your comment, I reset my "Cut The Rope" game (latest iOS ver. 2.0.1) to find the drawings all over again and I've verified that the drawing locations shown above are 100% accurate for the iOS version. For Android players, you can read the tips posted by "panda" below. 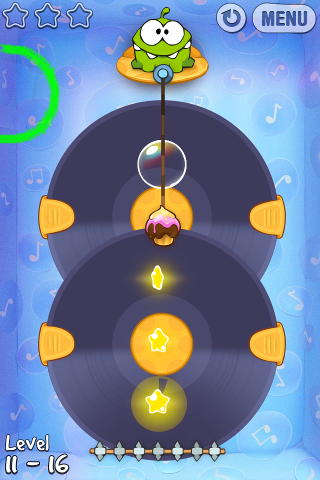 So far 2 Android players "Malwi D" and "Nick Murphy" have confirmed that the 7-14 drawing for Android platform is in "Cosmic Box" Level 14 on the left just under the moving spikes. Android version of picture 3-3 is located on bottom left instead of right. Cant tell u exactly where as I was just randomnly touching area s as I could see a paper. Please read all the other tips posted by the Android players. Android version 9-21 is on the left edge above blower. Only edge is visible. Took me forever to find it. Android 7-14 is the cosmic box. The picture is there but I don't know where. I just was running finger over screen and it appeared. I believe it I somewhere around the port hole. Cosmic Box is the 8th box (for iOS version). You forgot to mention which level in Cosmic Box. 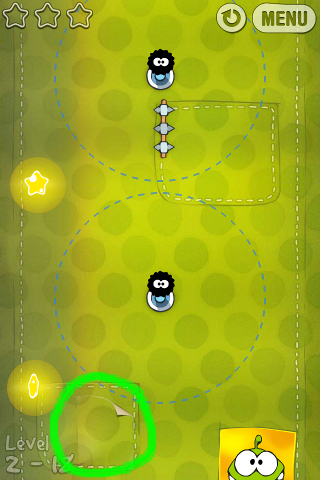 Are you saying the 7-14 drawing I show here is in Cosmic Box level 14 ? The picture you have as 7-14 is the same on the Android, the location is still level 7-14. The difference is the box as shown in list above. I hope this makes sense. I have a screen shot if u want it. The iOS version's level 7-14 is Gift Box Level 14. 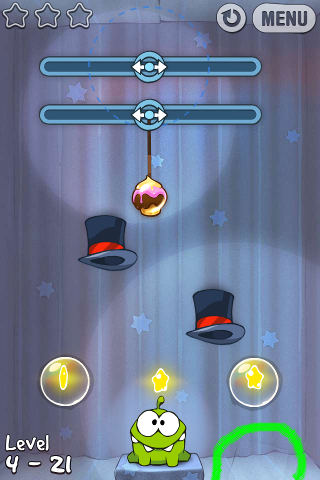 The Android version's level 7-14 is Cosmic Box Level 14. I saw your screenshot and it looks the same as iOS version's Cosmic Box Level 14 (Level 8-14 for iOS) but it's much longer. 2 Android players "Malwi D" and "Nick Murphy" have confirmed that the 7-14 drawing for Android platform is in "Cosmic Box" Level 14 on the left just under the moving spikes. Many Android players have problems finding this drawing, so I write this again here. 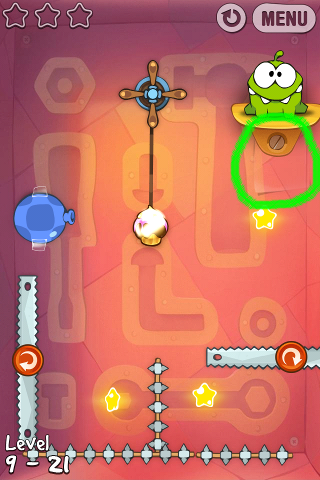 The picture of om nom in 7-14android version is in the lower left hand corner of the cosmic box.I jyst ran my finger across by where the valve thingy is and there it was finalllllllly. Kris L, that's right! !, thanks a lot!!!! Android 10-15 is also there in same general area but on very edge. You only see the edge of the paper. Also I cannot verify any others the handful I mentioned were very hard to find. The others were easier and I just looked at each level to find them. I believe they are the same but I am not positive as I didn't have your site earlier. Thanks for the help. According to "panda", the drawings are more well-hidden for the Android version, so you can try tapping all over the place inside the level or sliding your finger along the edges, etc. Look for something like a piece of paper. If other Android players like "panda" can remember, maybe they can answer this ? I only play the iPhone version. Thanks. 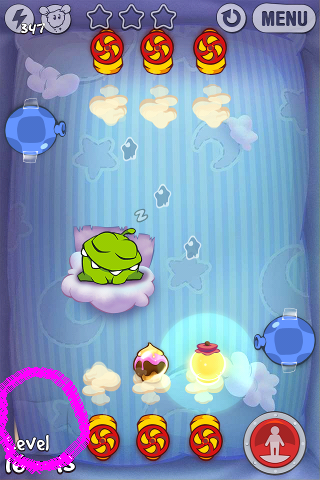 For Android, it is in 8-15, just to the left of Om Nom. 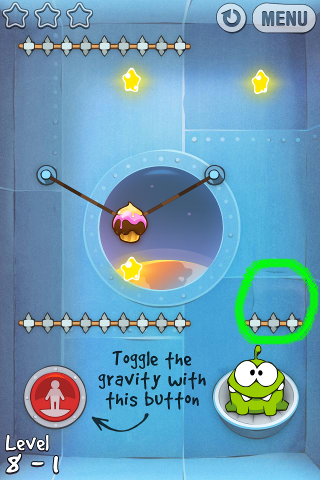 I was making diagonal swipes from bottom left to top right when I found it left of Om Nom. Good luck! Cant find the draw on the 8-1 spot, im playing on android. Did you read my instructions to Android players at the top portion of the article ? For Android players, I think you should just refer to my 1st 2 diagrams where I labelled the drawings with the level numbers because it seems like the level numbers are correct for both iOS and Android platforms. The drawings (labelled with box no. followed by level no.) causing the most confusion would be those located in Gift, Cosmic and Toy boxes (Box Nos. 6, 7 and 8) . Please read my explanation at the beginning of this article. So for the drawing which I labelled as 8-1, I think you should search for it in your Android version's Level 8-1 which is Toy Box Level 1. Don't look at the detailed drawing location for iOS ver. which is Cosmic Box Level 1. Even if it's the same box and same level like 3-3, the exact location is different. Read the tips posted by the Android players "panda" and "KetchupSpud". The drawings are more well-hidden for the Android version, so you have to search harder for them. The Android platform recently then introduced this "hidden drawings" feature. Ok, I got it now, yea i was confused, i was changing the 8-1 for 7-1 cus on the android it is the right number for the cosmic box hehe... sorry there, thanks a lot, this is the most complete guide ive found. Im having problems with 10-15 and 7-14 for android version. Did they moved it in some update? Sorry for the late reply, I was busy and didn't read my emails for more than 1 day. (1) 10-15 - Android 10-15 is also there in same general area but on very edge. You only see the edge of the paper. The drawings are more well-hidden for the Android version. I found the 10-15 already, the corner tip really helped (actually it was so hidden in corner that i have no idea how someone is supposed to find it without help). Ill try to find on other lvls, will write when i find it. You should "tap" on the screen actually, maybe it's because you slide your finger too fast so the app didn't recognize it. For the drawing in 7-14, you have to search in your Android version's Cosmic Box Level 14, not the Gift Box Level 14 which I show above for iOS players. You may have been searching in the wrong level. The new Steam Box drawing is in 13-9 on the extreme left of the screen about 3/4 up on the left edge. Are you playing using an Android device ? 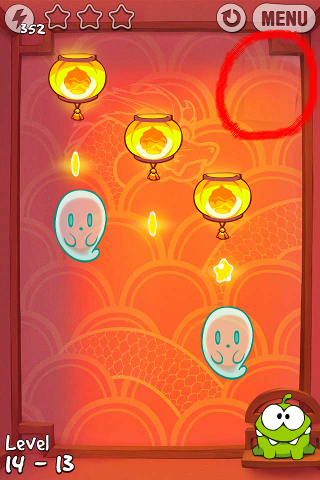 Can you remember where you get the drawing which I labelled with 7-14 because according to the Android player "panda", it's located in Cosmic Box Level 14 but I don't know why the Android player "Venitel" had problems finding it ? 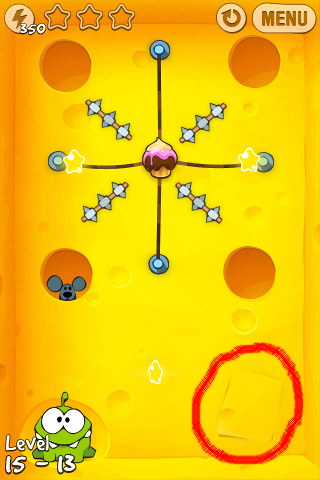 A new player "Malwi D" just commented that the drawing is on the left side near the spikes. 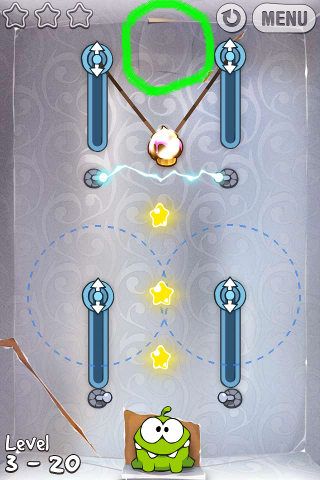 Yes 7-14 is in cosmic box level 14 on the left just under the moving spikes. You're confused actually. For the drawing which I labelled as 8-1, you should search in your Level 8-1, no matter whether you're using iOS or Android device. For iOS, Level 8-1 would mean Cosmic Box Level 1. For Android, Level 8-1 would mean Toy Box Level 1. So you were searching in the wrong level. Another Android player "Dikson Avila Rojas" asked me the same question on 4 January 2013 01:24, "Cant find the draw on the 8-1 spot, im playing on android." Later he realized his mistake. You can read his comments above. 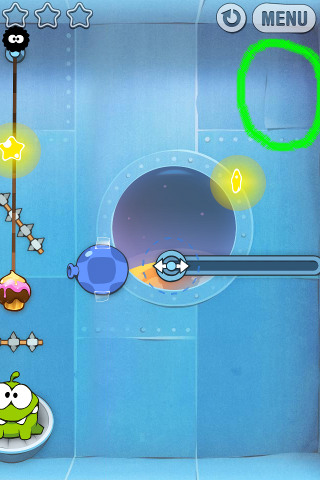 For iOS I already posted a screenshot above and circled the exact drawing location in level 13-9. Just in case other readers are wondering, he's referring to the drawing location for the 18th drawing in the iOS version. For the Android version, the new drawing should be in the same Level 14-13 but the exact location may be different. Just look for something like a piece of paper. Exactly, on Android is still on 14-13, but slightly more towards the center of the screen. Did you read the comments above ?? I only play the iPhone version, so I can only show the exact drawing location for the iOS version. But for Android players, you can refer to the 1st 3 diagrams which I posted at the top of this article because the box numbers and level numbers are correct for BOTH iOS and Android platforms. For the exact drawing locations, you can read the tips posted by the Android players. I have CTR for android, though cosmic box has number 8. Tips about 8-15 and 7-14 don't apply to me. Im missing the one with the tree. Any ideas? Do you mean Cosmic Box is box no. 8 for your Android version like iOS ver. ? Other Android players told me it's box no. 7 for them. That means there could be more than 1 type of Android version. Which Android device (Brand, Model) are you using then ? There're many types of Android devices. You try finding the drawings in both the iOS and Android locations. 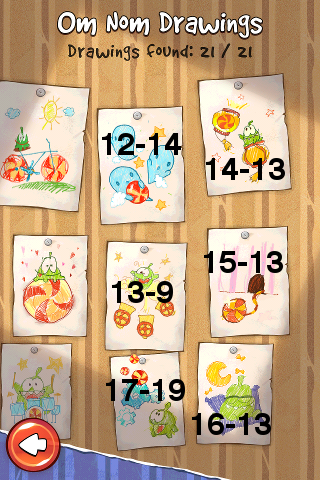 For Android version, the new hidden drawing is in the same Level 15-13 but it's just left of Om Nom. For Android (well... kindle so... kinda android?) I've found the om nom candy picture for 7-14 in 8-15, and the tree picture for 8-15 in 6-15. I cant find number 6, I'm on android. I read all of the comments and looked at the levels for android and ios and none are correct. This is my last drawing i need help! What do u mean by number 6 ?? Please read the top portion of this article and the comments by the Android players. You only miss 1 drawing so you may have missed something. The exact drawing location is different for iOS and Android even if it's the same box and level.